GERMANY AND TANZTHEATER GO TOGETHER LIKE BRAZIL AND SAMBA, LIKE SWEDEN AND WHITEGOODS, LIKE MARLON BRANDO AND FROZEN YOGHURT. SO, WHEN SPLINTERGROUP’S LAWN SETS ITSELF IN BERLIN, IT IS BUILDING ON THE ARCHAEOLOGICAL REMAINS OF EVERYONE FROM RUDOLF VON LABAN TO PINA BAUSCH AND SUSANNE LINKE. But Lawn is not a cross-section pastiche, nor is it an entirely new layer of topsoil sitting on the sedimentary layers of its forebears. Instead, it is of that species of creation peculiar to New World artists, one which absorbs and revels in the dense history of Europe while paradoxically yearning for the perceived naivety and sunlit banality of home. Of course, this is a grand fallacy—the cultural perpetuation of Terra Nullius—but, nevertheless, the notion that a green Brisbane lawn might be appealing amidst the overcast mire of Central Europe is hardly a stretch. Layers of European history are made immediately concrete as the audience enters the theatre for Lawn. The set is an immense and immensely clever deconstruction of a realist fourth wall box—Henrik Ibsen would feel at home if they could just get the walls straight. Indeed, the walls, with a touch of Expressionism reminiscent of Max Beckmann, are angled in such a manner that shifts in lighting can almost make them appear to move, a nightmarish illusion that presages the dance to come. Covering these are three layers of wallpaper, each one petering out before the top as though each subsequent generation had succumbed a little bit more to apathy. On the stage are three men: one eating cereal at a table, another vacuuming, the third brushing his teeth at a very European basin. With an entry point grounded so firmly in reality, the dance is almost invisible—the choreography camouflaged by familiarity and quotidian habit. And, in the context of Dance Massive, this is a markedly distant language to that of Chunky Move’s Mortal Engine or Shelley Lasica’s Vianne, for example, while Lucy Guerin Inc’s Untrained does dip its toes into this vocabulary. As the men continue their routine, the choreography comes more clearly into view. One realises that the three share the same space but not the same time. In a beguiling sequence, their gestures become a synchronised ripple of different purposes—one man might stretch his arm upwards to put on a jumper, another does the same to remove something from a bucket. At first, each man’s path through space is carefully calibrated so as not to interfere with the others, but even then they affect each other like spectres of history—more Old World layers. History does not stay spectral for long though. Two of the men start to mimic the third by manipulating a suit on a clothes hanger, and then move on to the man himself. Like a marionette, he is spun and dangled, hoisted and lowered, finally, into prostrate submission. 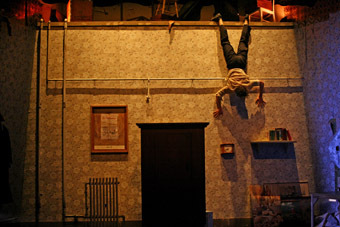 The puppetry propels Lawn into a thrilling conjugation of characters, as Vincent Crowley’s clean-freak triangulates the space with streaks of gladwrap, Grayson Millwood climbs like an insect up a wall and Gavin Webber throws himself around like a marionette without a master. Throughout, the dance remains anchored in psychology and in the imaginative leaps of the subconscious. When Millwood clambers across the walls, the simple spectacle of his virtuosity is woven into a reference to Franz Kafka’s Metamorphosis with all its attendant associations to Central European living. When Crowley performs a bastardised German folk dance, complete with lederhosen and piano accordion accompaniment, it balances the claustrophobic density and dark moods around it. Only once, during a fight sequence somewhat coordinated to movie sound effects, does the form of the dance feel forced. Towards the end of Lawn, Webber recounts a scene from the 1953 film Houdini, featuring Tony Curtis. In it, the escapologist finds himself trapped beneath the ice of a quickly moving frozen river and has to breathe the air he can find in pockets beneath the frozen crust. It is clearly an allegory for the three inhabitants of this increasingly dilapidated room. The velocity of European history, its cold ghosts and its air of inspiration all exist simultaneously. In the end, like Houdini, Lawn is a giant escape trick. Crowley slips into the darkness, Millwood disappears under a rug while Webber, all suited up, basks in the warm glow of a Brisbane front yard, happily oblivious to the darkness that engulfs him as the lights go down.